Penguins are the birds that can’t fly, despite having wings. But, they love to swim and spend almost 75% of their time in the oceans. Penguins have special adaptions, which help them to survive very cold weather of Antarctica and cold waters. Penguins don’t hesitate to come closer to human explorers. Probably because they don’t have a land predator in such cold regions. But, the sea is full of risks for them because they are mostly hunted by sea creatures like sharks and seals. 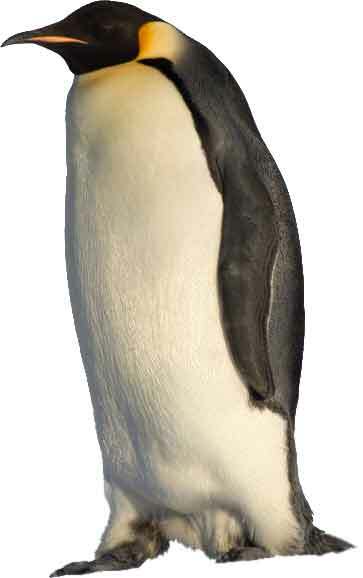 The largest species of penguin is called emperor penguin. 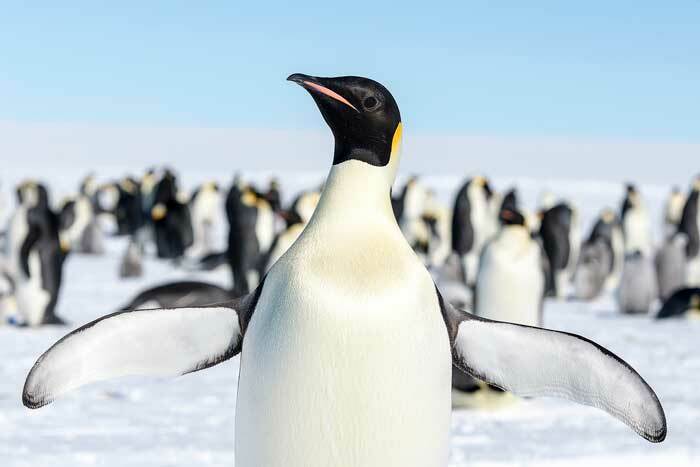 Emperor penguins can grow as tall as 1 meter (3 feet). 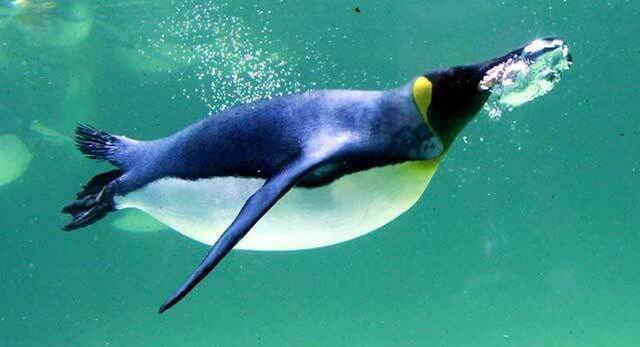 Penguins can reach a speed of 12 km/h (7.5 mph) in water. In the case of emperor penguins, they can dive as deep as 565 meters (1850 feet) and may remain at that depth for 20 minutes. Penguins can also glide on their bellies on the ice. Penguins have mostly two colors on their body; black and white. Their backside is covered with black color and front side with white color. These two colors provide them excellent camouflage when they go for swimming. In the ocean, when they are seen from below, their front side matches with light sky due to their white color. Similarly, when they are seen from above they black color matches with the dark ocean floor. Penguins have two eyes, which provide them very sharp vision. They have two flippers which can’t help them in flying but help them in swimming. They have a small bill and special nostrils which help them catching the fishes and conserving their heat. Penguins love to eat small fishes including krill, squids, and octopuses in their diet. 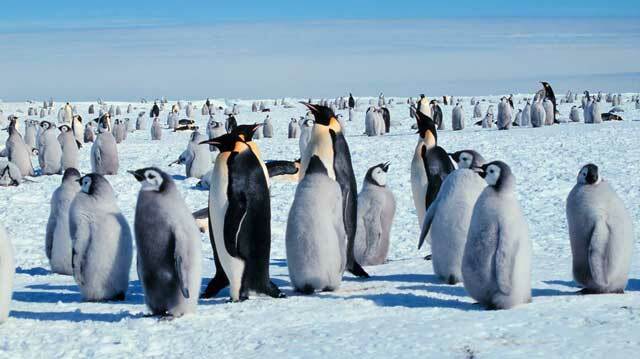 Penguins are mostly found in cold regions of Southern Hemisphere. However, one species of penguins known as Galapagos penguin is found at islands near equators. They mostly in Antarctica, Australia, and South Africa. Many species of penguins are placed on the vulnerable list. Among them, some species penguins have been declared endangered by International Union of Conservation of Nature, including Galapagos penguins and northern Rockhopper. The largest species of the penguins is known as emperor penguin. Penguins can jump up to 3 meters in length. Penguins live 80 percent of their lives in the ocean. They can also drink salt water. Rockhopper penguins can’t glide on the ice like other penguins. Abdul Wahab, "Penguins," in Science4Fun, April 13, 2019, http://science4fun.info/penguin/.